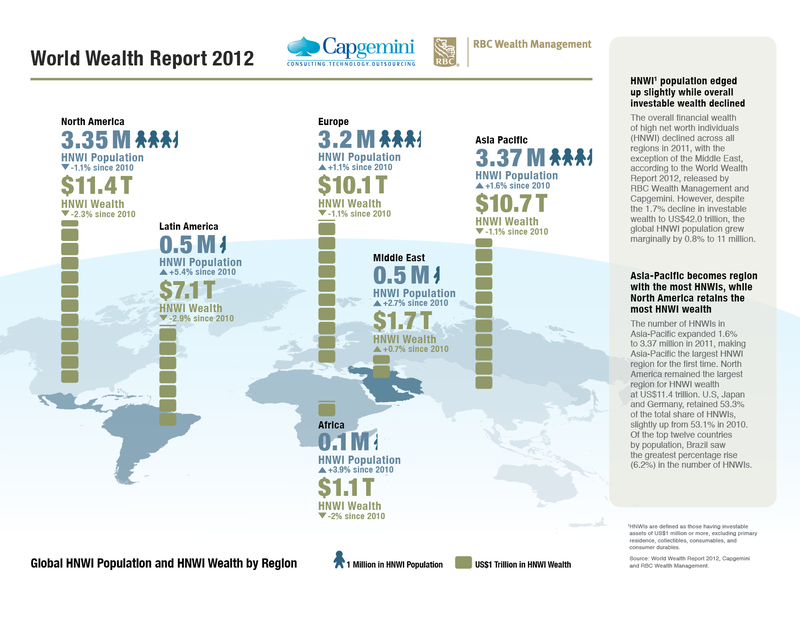 Fast-growing Asia-Pacific for the first time outnumbered North America in the number of dollar millionaires, according to the World Wealth Report 2012, released by Capgemini and RBC Wealth Management on June 19. The region now has the highest number of dollar millionaires in the world, counting 3.37 million high net worth individuals, defined as people with at least $1 million available to spend or invest, excluding personal assets such as primary homes, collectibles and consumer durables. However, North America remained the richest region at $11.4 trillion compared to $10.7 trillion in Asia-Pacific. Due to global financial volatilities, overall wealth fell across all regions except the Middle East, the survey says. Global high net worth wealth in 2011 fell by 1.7 per cent to $42.0 trillion. The worldwide number of millionaires only increased by 0.8 per cent to 11 million. The millionaire population country ranking saw South Korea replace India for the 12th position, while the top three countries, US, Japan and Germany, retained 53.3 per cent of the total share, slightly up from 53.1 percent in 2010. Of the top twelve countries by population, Brazil saw the greatest percentage rise (6.2 per cent) in the number of millionaires. In Asia, strong economic growth in China and other markets increased the ranks of millionaires across the region by 1.6 per cent. China accounted for about half the increase of millionaires in the Asia-Pacific, where the super-rich – people with $30 million or more to invest – increased 5.2 per cent to 562,000, placing the country fourth behind the US, Japan and Germany. Hong Kong and Singapore both saw falling numbers of millionaires. The number of high net worth individuals in Hong Kong fell 17.4 per cent to 83,600 in 2011, compared with a decline of 7.8 per cent to 91,200 people in Singapore, enabling the city state to overtake Hong Kong as home to Asia’s wealthy. “It is significant that for the first time this year there are now more high net worth individuals in Asia-Pacific than in any other region. However, losses in key markets such as Hong Kong and India meant that wealth contracted in Asia-Pacific overall,” said George Lewis, Group Head of RBC Wealth Management. One thing preventing the HNW group from investing is the fact they are new money concerned about GROWING and hiding their wealth. Growing their wealth they became used to 200% + growth you. Traditional wealth managers and hedge funds try to beat benchmarks like the S&P 500 (like 7-9% +). Second. I believe the the US reclaimed the spot of most HNW individuals. Probably because more and more rich people from the the BRICS are parking their money here and becoming citz. The tiger tycoons are on the rise – old Europe and US beware..